Whether a great way to spend an evening out or the motivation behind a cross-country trip, a concert is ideal for making some fantastic memories, collecting a story or two, and generally have a blast! Orlando is home to plenty of big names when it comes to great concerts. Just say you stopped by one of these places, and your friends will know you had a great time! Check out the offerings of one of these thrilling locations before you book your exciting Orlando trip. You're probably heard of the Amway Center before. Its iconic spire is recognized across the country as one of the staples of big-event hosting. Make sure you get a picture of the building before you enter in, to show off the fun you're about to have! The Amway Center takes entertainment seriously, capable of holding over 20,000 people. It boasts unique concessions and activities for kids and adults alike to enjoy in the concourses. You'll see why so many sports teams love to play here! Perhaps best of all is its location—being downtown means there's plenty to do nearby. Camping World Stadium is an older venue, begun back during the Great Depression as part of the Works Progress Administration—but it has kept up with the times, recent renovations making it bigger and better than ever. Over forty thousand lower-bowl seats enjoy plenty of legroom and get you close to the action. Newly-installed gigantic video displays deliver the spectacle to every seat. And, to best enjoy Florida’s lovely climate, patrons can find both enclosed and open-air seating. If there’s someone you’ve always wanted to see live, Camping World Stadium would be a great place to see them! For a smaller, more intimate setting, make time to get to the House of Blues. The delicious southern fare is worthy of the Disney Springs area, with specialties like shrimp and grits that keep people coming back for more. If you want your food as good as your music, then this is the place to be! The place is small enough that you can always be close to the music, whether you want to sit and enjoy your food or good up and dance! 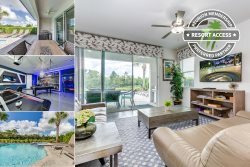 Whether it's a small swing shindig at House of Blues or a raucous rock n' roll riot at Amway Center, there's no better place to return home to than a vacation rental with Reunion Vacation Homes. Browse our listings or call us at 1-855-453-5400 and you'll find we have something for everyone—no matter what music they love!